This summer, look for bag codes on bags of LAY’S Potato Chips and visit laysflavorkick.com to enter the Lay’s Flavor Kick Sweepstakes. 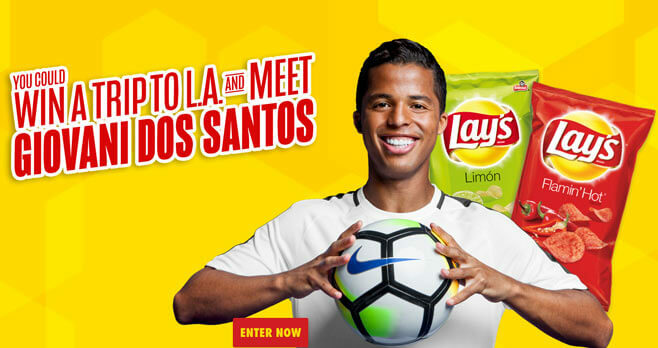 You could win a trip to Los Angeles, California to attend an LA Galaxy home game plus the opportunity to meet Giovani Dos Santos. Ends: Ends at 11:59:59 p.m. CT on July 21, 2018. Eligibility: The Lay’s Flavor Kick Sweepstakes is open only to legal residents residing in one of the 50 United States or the District of Columbia, 13 years of age or older at the time of participation.